While missiles pounded southern Israel and the IDF prepared to rout Hamas terror in a ground campaign, Israeli technology was once again proving its versatility. The world was stunned last week at the effectiveness of the Israeli-developed Iron Dome anti-missile system as it began shooting down Hamas rockets — and it was stunned again a few days later, when an international study declared Tel Aviv to be the second best place in the world for start-ups. 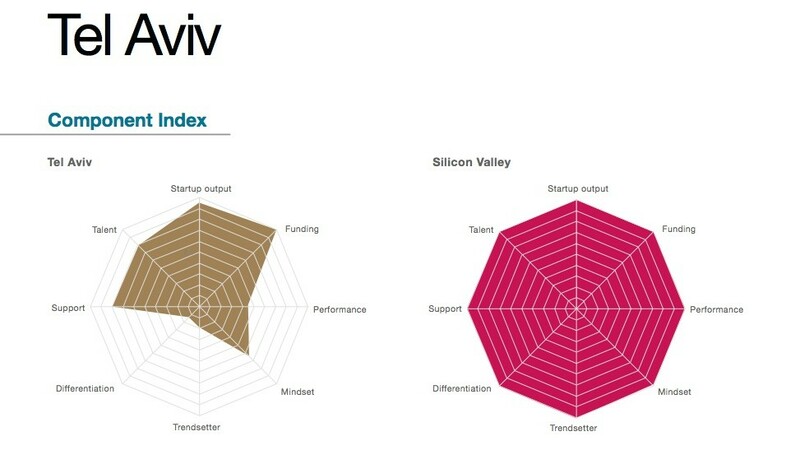 Tel Aviv was just behind Silicon Valley as the best place in the world to establish a tech start-up, according to Startup Genome, which created a tool called Startup Compass to, for the first time, scientifically measure the factors that go into start-up success. The US-based company was established in 2010 after a landmark study came out that nearly all US job growth these days is being driven by start-ups. For the past year, the company has been polling start-ups — some 50,000 from around the world are in Startup Genome’s database asking them in-depth questions on what makes them tick, what works and what doesn’t. The system then crunched that data based on criteria developed by top entrepreneurs, tech companies, and researchers from University of California Berkeley, Oxford, and Stanford — in short, the people who know what start-up success should look like. The study was prepared with support from Spain’s Telefonica Digital, which itself is a major funder and supporter of start-ups in Europe. Tel Aviv, second on the list, was bested only by Silicon Valley, but beat out other top start-up cities, like Los Angeles, third on the list, and Seattle, New York, Boston, and London. So what goes into making for start-up success? Of course, there are the usual factors, like talent and funding. 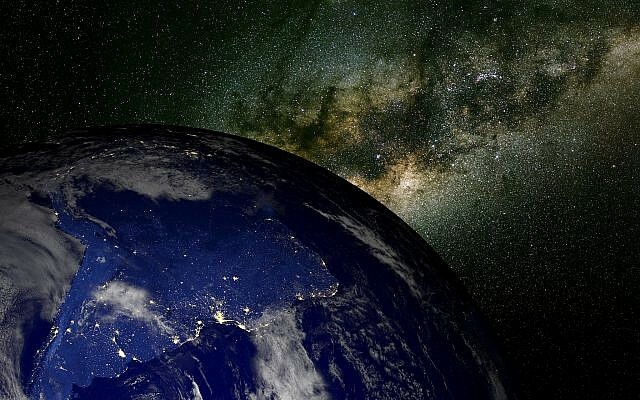 But those are only two factors of what the project calls the “start-up ecosystem,” which includes factors like how much a region’s laws and culture encourage entrepreneurship, infrastructure, the “vision” of entrepreneurs in a given location, the age, education, and expertise of talent a start-up can draw on, the kinds of funding options available, and more. Startup Genome questioned companies on these and other factors with the StartupCompass tool, analyzed the results, and came up with recommendations for start-ups about what to do and what to avoid during each stage of their existence. When it comes to a successful start-up ecosystem, Tel Aviv beats just about every other place, except for Silicon Valley. 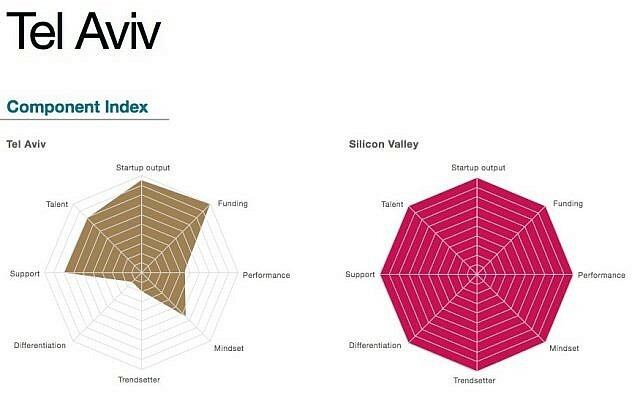 As the world’s top start-up ecosystem, “the Valley” sets the benchmark for start-up success, and Tel Aviv (referring to the entire metropolitan area and taking into account start-ups in Herzliya, Ra’anana, etc.) comes as close as anyone to that benchmark. For example, 40 percent of Tel Aviv entrepreneurs have a Master’s degree or a PhD, compared to 42% of entrepreneurs in Silicon Valley; employees in Tel Aviv and Silicon Valley work a similar number of hours; and start-ups in both locations generate similar numbers of jobs. And in some cases, the Tel Aviv “student” outdoes the Valley “master”: Twenty-seven percent of Israeli start-ups, for example, get income from paying customers, significantly more than similar companies in Silicon Valley. Tel Aviv itself, as an ecosystem, ranks second globally “because it has the second highest output index of start-ups with a healthy funnel of start-ups across the developmental life cycle, a highly developed funding ecosystem, a strong entrepreneurial culture, a vibrant support ecosystem and a plentiful supply of talent.” That talent, said the report, is key; with the highest percentage of scientists and engineers of any country in the world, start-ups have all the brainpower they need to succeed.